I’m certain I’m not the only person that’s annoyed at coming across useless reviews on the App Store and Google Play Store; you know, the ones that just read “5 stars! Instabuy!” or “This game is really fun!” or “Boring”. Is it really that difficult to give some constructive criticism or elaborate why you think the game is fun? I’m not sure about most folks but when I’m looking for opinions or any justification for purchasing an app, I want to some proper details. The chance of me getting something due to 10,000 5-star ratings and a bunch of reviews that consist mostly of “Great!” isn’t very high but I must admit that the high rating WILL get me to at least read the app description and take a look at the screenshots. Yeah, I know there are sites dedicated to reviewing apps but why should I have to deliberately go to one of those when there’s a bloody section under each product information page dedicated to USER REVIEWS? A good review doesn’t have to comprise of 1,000 words. A simple list of pros and cons would do the trick. Honestly, I think the section should be renamed to “USER COMMENTS” like on YouTube because that’s pretty much what they’re like. Some devs honestly want feedback which is great because it’s an indication that they actually care what people think about their products. And it’s really great when the request for a review appears after using the app multiple times or an extended period of time. Why? Well, you’d most likely be familiar with it enough to write something meaningful that will help developers understand the needs and wants of their users to improve their works. As well, you’d end up assisting fellow iOS and/or Android users to make the decision of whether or not they should install the application. After all, that’s the purpose of reviews, yes? PLEASE REVIEW IT … even before you play it! 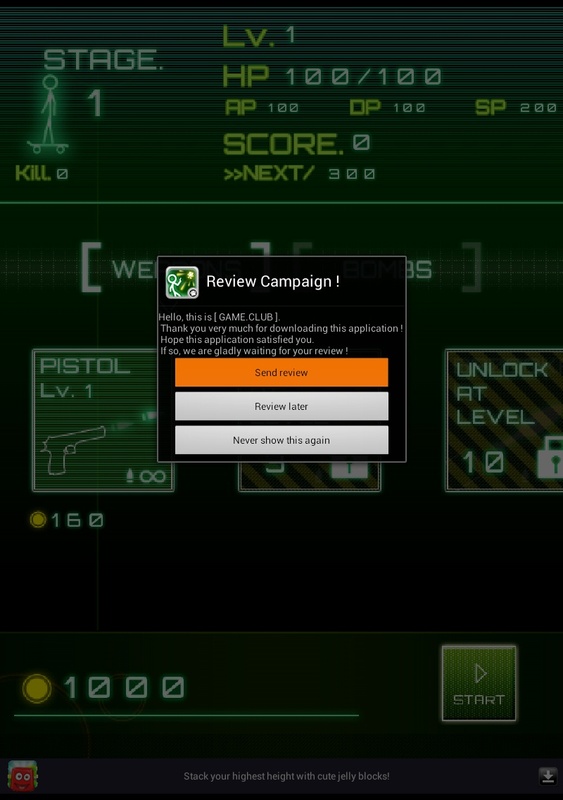 Yeah, I can see the “Review Later” button but how could they honestly hope that the “application satisfied” me when I didn’t even have the chance to play the game? No one can magically form an opinion before experiencing the product. Obviously, these guys didn’t grasp the concept of properly timing the request. Companies do this to inflate their ranking on the app stores, thus allowing them to be “featured apps” and also have more visibility on the apps charts. Besides, highly ranked apps are most likely to be downloaded/purchased. Com2uS USED to do this but have since gotten smart and changed their spiel to something like “Your positive reviews will keep us motivated!”. 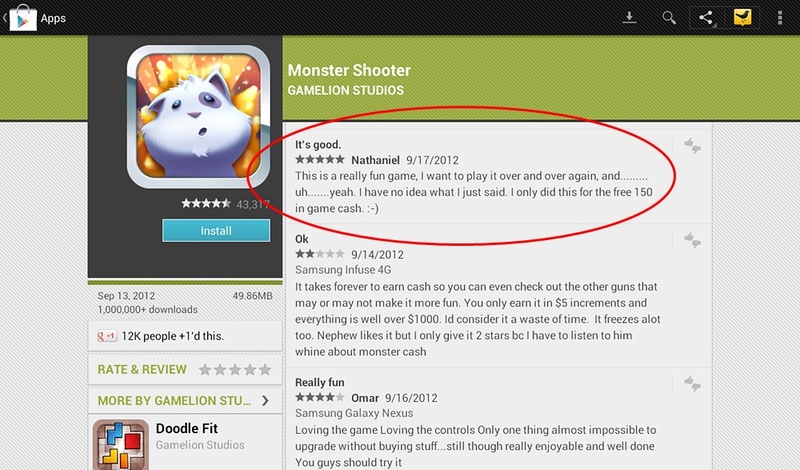 I think a lot of freemium-loving devs still pointedly ask for the 5 stars though. Yes, there WILL be people that actually like an app and will gladly rate it full stars. I realize that. But there’s also a fact that many users are just doing it because it’s specifically petitioning you to do so. User reviews aren’t meant for praising the hell out of developers. If there’s something genuinely disrupting your enjoyment of the app, mention it. Chances are, there are other users like you and would like to know about the issue. Opinions and experiences can change the more you use an app so one should consider modifying an existing review. For example, I’ve seen instances where people leave a review about bugs only to revise them later on after an update fixes the problems. It’s great that fellow users do this because sometimes, the change logs don’t have any information or just provide a generic “bug fix” statement. However, I wish more revisions would happen with those apps where the review request happens way too early like in some roleplaying games. I mean, 5 minutes into it and you’re asking me to review it? Unless the total gameplay actually lasts 5 minutes and I’ve experienced all that it could offer, I refuse to write anything about it. Can you imagine professional reviewers basing their reviews on a few minutes of using an app? It just doesn’t make any sense. This relates to those semi-social/social games like Rage of Bahamut where the player providing the referral code and the player entering it will both benefit in-game in some way. I suppose it could be seen as helping out a new user but come on, there are A LOT of message forums dedicated to mobile games and there’s a good possibility that the developers have a forum for the game too. Do the code listing on those instead. I suppose I should add some sort of conclusion. Basically, I wrote this up just to vent some of the frustrations I have regarding developers exploiting the review system and users just being dumb. When it comes to rating an app, reviews are OPTIONAL on BOTH the App Store and Google Play Store so if you don’t have anything marginally useful to say, just select the number of stars you want to give an app and, for the love of God, don’t write anything. If you have to, be honest and provide some information that other users can walk away with. For instance, if you really like something, explain why.